There haven’t been too many clashes between these sides before, they have only met twice, and the Greek side has managed to win both of these games. This and home advantage ensures Panathinaikos start off as favourites for the game on Friday night but they haven’t been in the best of form of late, so they not may be at their best coming into this clash with their Turkish opponents. The Greeks are currently 4-4 in the Euroleague which is a record that they will definitely need to improve on. One player that has been in good form of late for the hosts is Nick Calathes. Calathes has managed to clock up an average of 13.3 points per game so far this season while also offering an average of 5.5 rebounds per game and an average of 7.8 assists per game. Other big players for the Greek side have been KC Rivers, who has provided an average of 11.4 points per game and Chris Singleton, who has notched up an average of 11 points per game so far this season. There isn’t much between these sides when it comes to their offensive records, with the Greeks scoring an average of 80.2 points per game against the 81.6 points per game average of the Turkish side. There is a big blow to the Greeks though with the loss of James Gist, who is set to be absent for a lengthy period of time. The Turkish side have given up an average of 80.0 points per game while the Greeks have a slightly better record of 78.8 points per game, so that is something the away side will need to work on. Brad Wanamaker has been a key player for Darussafaka so far this season and he has an average of 13.8 points per game this season, aided by James Anderson with an average of 11.8 points per game and Will Clyburn with an average of 11.6 points per game. These are the players that need to step up and be counted if the Turkish side are going to put some clear daylight between themselves and Panathinaikos at the end of this week. 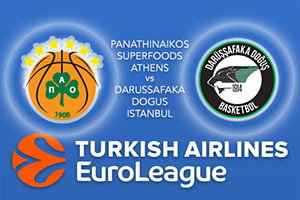 Take Panathinaikos Superfoods Athens at -5.5 at odds of 1.90 in this game. For the Over/Under market, look to go OVER 155.0 available at odds of 1.90. Bet Now!